What is a toad-crossing ? Toads spend the majority their year on land, in woodland, hedgerows and gardens. They are nocturnal creatures, and hibernate each winter in frost-free undergrowth or holes. Every Spring they must return to the water for reproduction. Toads have been following this cycle for thousands of years; it is only in the last century that they have encountered significant road traffic during their annual migration. Every Spring, thousands of toads are accidentally killed as they undertake their night-time crossing of the roads across the United Kingdom. There is strong evidence to suggest that the UK population of toads is decreasing, and although it is unlikely that road deaths are the cause, this risk is certainly now a factor affecting the toad's conservation status. Toad crossings aim to minimise the number of road deaths, and to reduce the negative impact of the human environment upon these popular amphibians. 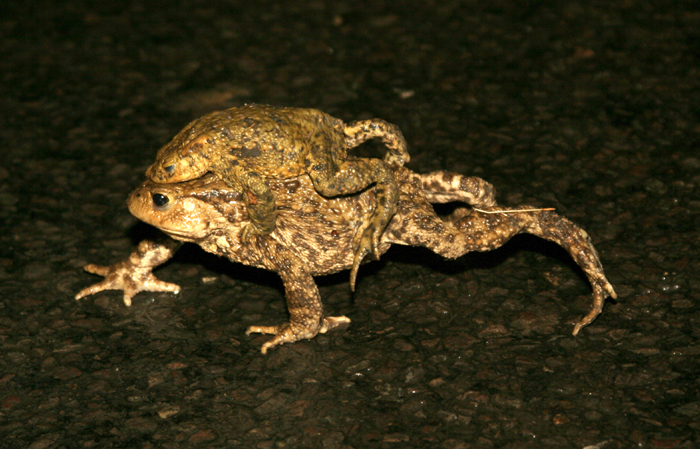 What happens at a toad-crossing ? Toad crossings are manned by volunteers for a few spring nights, every year, in late February or early March, usually following a rainy day. The volunteers use buckets to collect any frogs, toads or newts which attempt to cross roads, and safely transport them to the destination side of the road. Required equipment includes buckets (for transporting the amphibians), torches for visibility and to find the animals, high-reflective vests (supplied by ARG UK) and a thermos flask filled with hot chocolate, or the drink of your choice ! Each registered crossing has a volunteer organiser, and many crossings have been manned by the same group of people for many years. Although the crossings are only active for a few days per year, they can provide a good basis for a social experience, as most volunteers are local people, that you may not have the chance to meet in daily life. Recording the number of toads seen is a critical activity as this provides the evidence needed to determine population changes. You can view data from SARG toad-crossing sites by clicking on the site number in the table below. 5 Earlswood Lakes, Woodhatch Rd Reigate TQ271453 Reigate & Ban. If you are aware of a toad-crossing location, that is not listed above, and believe it should be considered as an official crossing site: please download this form and submit it to the address listed.